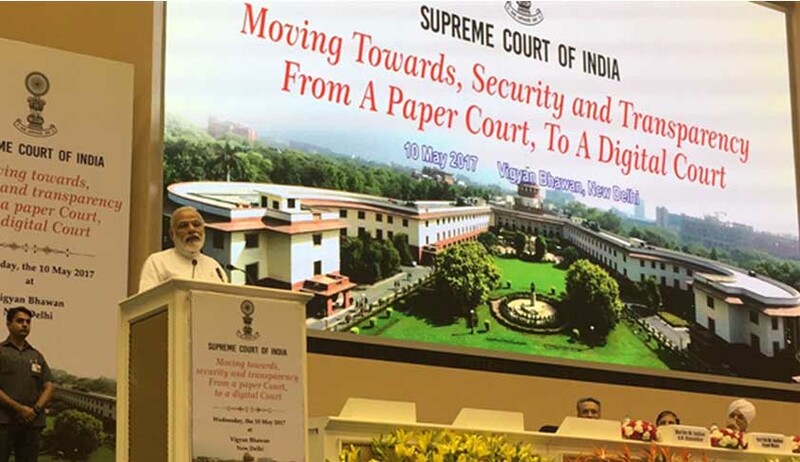 Applauding the Supreme Court’s initiative to go paperless, Prime Minister Narendra Modi on Wednesday said technology plays a vital role for more effective judicial system and there is a need for change of mindset to adopt it. “In our criminal justice system, we have relied on mobile phone details and CCTV footage as evidence in accident cases to deliver judgment. With fast growing IT, we need to cope with the changing world,” Narendra Modi said while launching the Supreme Court’s Integrated Case Management Information System (ICMIS). Advocating the arithmetic formula IT + IT = IT, the PM said Information Technology + Indian Talent = India Tomorrow. Reiterating his government’s dream project Digital India, Narendra Modi said e-governance means effective, easy, economic and environment friendly. “When we go for digitisation, we contribute a lot to our environment. Issues like saving water, trees will be addressed,” he said, while asking people associated with judiciary to change their mindset and adopt digital technology so that the country can cope with the changing world. Citing the government’s move to provide access to justice for poor, he appealed to the legal fraternity to join the pro bono movement and provide legal aid to poor people through digital system introduced by the government recently. He appreciated the apex court’s move for digital court and appreciated Chief Justice of India (CJI) JS Khehar’s decision to hold courts during summer vacation. “The country is changing. We are working during holidays (referring to the CJI’s decision to hear some important constitutional issues). Such move will restore the public’s faith in judiciary. To make new India, change is essential,” Narendra Modi said. The CJI, in his address, announced that the Supreme Court Registry would start e-filing of cases soon after the summer vacation is over in the first week of July. “Nobody can manipulate the documents. Litigant can track the status of case and also orders. Everything about the case can be monitored,” the CJI said. He proposed all high courts and lower courts to go paperless. Union Law Minister Ravi Shankar Prasad, who was present at the event, said the government’s aim is not only digitization, but also to make India the leader of digital world. He asked the judiciary to extend support to the digital court to achieve the constitutional goal of speedy access to justice.